Miami-based Related Group closed on the purchase of part of a master–planned community in Tampa for $11.81 million. Relate bought 8.5 acres of a 52-acre master-planned community called Westshore Marina District. Related plans to build a 396-unit apartment complex on the site, located on the eastern end of the Gandy Bridge that connects St. Petersburg and Tampa. Fort Lauderdale-based BTI Partners, the master developer of the Westshore Marina District. has designed the development of the 52-acre site to include retail stores, offices, a 200-room hotel and as many as 1,750 residences, plus a 1.5 mile park along the waterfront and at least 185 boat slips. Miami-based Related Group opened a 300-unit apartment building in Doral with monthly rents up to $3,600. Related offers studios and one-, two- and three-bedroom apartments at The Flats Apartments, located in the mixed-used CityPlace Doral development. Monthly rents start at $1,645. Residents of The Flats will have ground-floor access to the first Fresh Market grocery store in Doral, one of more thansssssss40 tenants of CityPlace Doral that will include CinéBistro and Improv Comedy Club. CityPlace Doral, expected to open early this year, will have more than 300,000 square feet of retail space. Besides The Flats, the residential component of CityPlace Doral includes another rental property called The Manor Apartments, and Oasis, a residential project developed in partnership with Shoma Homes. Oasis is 90 percent sold with unsold eight homes remaining. A new luxury apartment complex at CityPlace Doral The Flats Luxury Apartments in Doral is now available for lease and is expected to open in February. The Related Group announced pricing for The Flats Apartments, comprised of two towers atop part of CityPlace Doral’s 300,000-square-feet of retail. Residences range from studios to three-bedrooms, priced between $1,645 to $3,600. The Flats Apartments is conveniently located atop CityPlace Doral, a master-planned community poised to become South Florida’s hottest destination for upscale living, shopping, dining and entertainment. At the ground floor of The Flats Apartments, residents will have direct access to the city’s very first Fresh Market as well as a collection of over 40 world-class retailers, including anchors like Kings America, CinéBistro and Improv Comedy Club. CityPlace Doral features over 300,000 sq. ft. of retail space and is slated to open in early 2017. TAMPA — Two major apartment projects — one in downtown St. Petersburg, the other on the water in Tampa’s Gandy Boulevard area — could start construction next year. The Miami-based Related Group, one of Florida’s leading residential developers, announced Monday that it expects to close next week on the site of a proposed 15-story, 354-unit apartment building at 801 Central Avenue in St. Petersburg’s burgeoning Edge District. On the Tampa side of the bay, Related is planning a four-story, 396-unit project just south of Gandy Boulevard and west of Westshore Boulevard. Dubbed Town at Westshore Marina District, Related’s Tampa apartments will be on eight acres of a 52- acre site once planned for a grandiose development called New Port Tampa. That collapsed during the recession, and in 2015 BTI Partners of South Florida acquired the property. It has been marketing parcels to developers like Related. Patterson said he could not disclose the land price of the apartment complex, which will cost about $80 million. Most of the units will have views of the water including Tampa Bay, he said. Two bedroom apartments likely will start around $1,800 or $1,900. Patterson said Related expects to close on its parcel in the next three or four weeks. BTI, which is awaiting final city approval of its master plan for the 52 acres, will be reopening roads, making other infrastructure improvements and putting in landscaping. In addition to Related, BTI has “multiple buyers in place right now” for both residential and ownership projects, executive vice president Beck Daniel said Monday. BTI also is talking to groups interested in commercial and retail space. In St. Petersburg, the as yet-unnamed Related project comes in the midst of a luxury apartment boom that has added some 2,000 new rental units to the market in the past few years. Within two blocks of the Related property are the newly completed, eight-story, 384-unit Hermitage and the future site of 930 Central Flats, a 218- unit, five-story building now under construction. Despite some concerns that downtown St. Petersburg could be getting saturated with expensive apartments, Patterson said he thinks the demand is strong, especially among slightly older tenants. The site of the Related project is currently owned by a Tampa company that planned to put a four-story apartment building atop the 1926 Union Trust Co. bank, which is on the National Registry of Historic Places. Patterson said Related will demolish some later additions to the building, but preserve the original neoclassical structure for possible retail or restaurant use. Construction on the apartments, which are near a new Publix and across the street from the Morean Arts Center, could start around June, Patterson said. The Central Avenue apartments will be Related’s first project in Pinellas County. In Tampa, it is building the 304-unit, 21-story Manor on Harbour Island and plans a 400-unit rental complex on the site of the Tampa Tribune building on the Hillsborough River in downtown Tampa. In June, the Tampa Housing Authority tapped Related for the $400 million West River redevelopment project that will include a mix of market-rate and subsidized housing units. One of the largest Hispanic-owned businesses in the United States, Related has built, renovated and managed more than 90,000 condominium and apartment units. It developed many of South Florida’s best known condo towers, including the 41-story Trump Tower Hollywood. Broward County endorsed a plan by Related Group and a partner to lease county land at Andrews Avenue and Sistrunk Boulevard and build apartments there, most of them with rents below market rates. County commissioners voted November 29 to negotiate a land lease agreement with Miami-based Related Group and a company called Flagler Warehouse 1, co-owned by Doug McCraw, founder of the Flagler Arts and Technology Village, or FATVillage. McCraw’s company and Related have formed a company called Related FATVillage LLC to build a mixed-use development with 150 apartments, including 109 that would be available at below-market rates. Most of the apartments would have below-market monthly rents, including $1,631 for studios and $1,957 for two-bedroom units. The development team tried to price the below-market units to keep rent from exceeding 30 percent of a tenant’s income. The mixed-use development, called The Gallery at FAT Village, would have retail-store and art-gallery space on the ground floor. Related FATVillage LLC would make payments on the county land lease over a 60-year term. 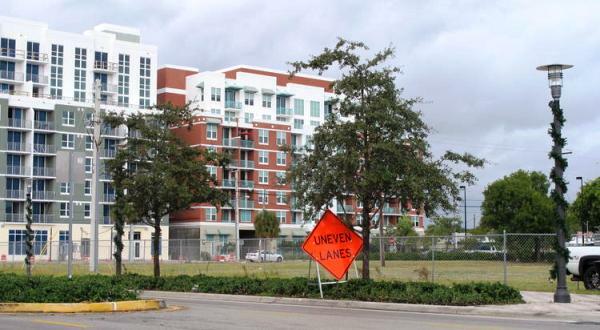 The county acquired the land at 600 North Andrews Avenue after a developer failed to build affordable housing there, one of two failed attempts to put below-market rentals on the property, county officials told the Sun-Sentinel.